I took today off to use up a personal day. Use it or loose it! I didn’t manage to sleep in, thanks to Tanner and Clifford for being up at 530 every single day. I caught up on Sleepy Hollow (random show that I really like! ), organized my necklaces and scarves, dusted, vacuumed, laundry, got dinner in the crock pot and am now enjoying a nice long workout at the gym. The pop and hip hop station on Pandora is fantastic. Great for cardio. A little light reading of Bodyweight Strength Training Anatomy by Bret Contreras for some easy on the road workouts. 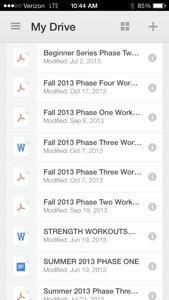 And reviewing Best Body Workout files that I store on a Google Drive for workout inspiration.